-- Eleanor Roosevelt, in what New York Times columnist Gail Collins called a "tartly" delivered comment to reporters. It was made, presumably, in 1960 or 1961; the occasion, Collins writes, was the announcement of "the all-male list" of senior appointees in the new administration of President John F. Kennedy. 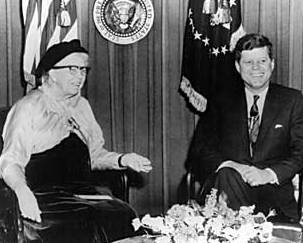 (credit for March 1961 photo of ER and JFK) This criticism by Roosevelt -- among IntLawGrrls' very 1st transnational foremothers -- prompted Kennedy to issue Executive Order 10980 (1961), which established the President's Commission on the Status of Women. 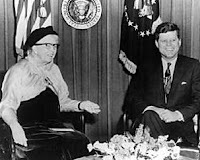 The work of the 3-year commission, which Roosevelt chaired till her death in 1962, has been complemented by Women in America, a report on women and girls in the United States just released by the White House Council on Women and Girls.